Does the thought of giving a presentation scare you? Do you get tongue tied? Do your presentations lack spark? Do people remember your message? Do you want to deliver presentations more confidently, clearly and with impact? The aim of the workshop is to enable you to develop the key skills of making effective presentations. During the workshop you will learn how to deliver engaging presentations which are well structured, purposeful, persuasive, and above all, relevant to your audience. There will be a number of practical sessions which will focus on improving delivery style and provide an opportunity to practice the skills. We use a variety of learning methods; from observing and critiquing ‘published’ presentations, to presenting and critiquing yourself and other delegates. Where are you now? 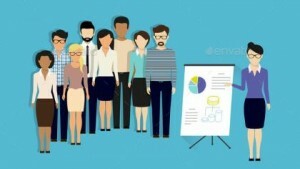 How effective are your current presentation skills? What makes a presentation a success?